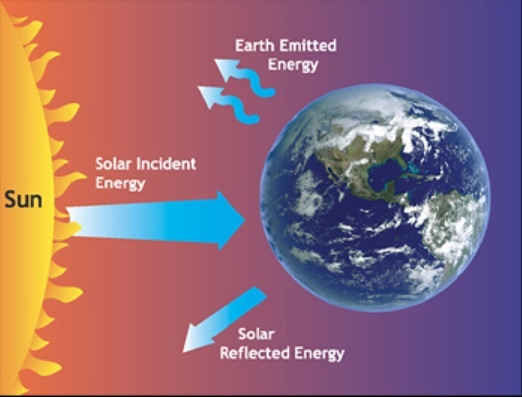 Solar energy is radiant energy produced by the sun. Like other stars, the sun is a big ball of gases and plasma – mostly hydrogen and helium, held together by strong gravitational forces. Solar energy is created at the core of the sun when hydrogen atoms are fused into helium by nuclear fusion. The core occupies an area from the sun’s center to about a quarter of the star’s radius. At the core, gravity pulls all of the mass of the sun inward and creates intense pressure. This pressure is high enough to force the fusion of atomic masses. During the nuclear fusion process some matter is converted into solar energy, which is radiated into space as electromagnetic radiation. This energy is carried by photons. It takes more than 100,000 years for the photons created in the sun’s core to make their way to the surface, and then just a little over eight minutes to travel to earth at the speed of light. To learn more about the sun, click here. Because of the distance from the sun and the earth's size (relative to the sun) only about 1/2 of one billionth of the energy produced by the sun reaches the earth. In order to quantify how much energy this is, we define solar irradiance as the amount of radiant electromagnetic energy emitted by the Sun over all wavelengths that fall each second on 1 square meter (m2) outside Earth's atmosphere. This amount is known as the solar constant; its value is approximately 1,367.7 watts per square meter. For a more detailed explanation of the inverse square law, what electromagnetic energy is, the solar constant and the composition of the solar energy that reaches the earth's atmosphere please read our section on irradiance. Most of the time the solar energy reaching the earth is fairly constant and generally benign. However, because different parts of the sun (which is basically gaseous) spin around its axis at differing speeds (faster at the equator than the poles), this causes the magnetic flux to twist and loop every 22 years, which is called the solar cycle. Basically, this refers to the fact that the polarity of the sun changes every 11.1 years and takes 22 years to return to "normal". As a result of these tremendous magnetic forces the sun can literally explode and send out solar flares , or critical mass ejections or both together. Since 1859 a number of these solar storms have caused havoc with the telegraph, grid system, radio, GPS, satellites, and more. NASA scientists and others are concerned that the USA and several other locations on Earth could be particularly vulnerable if such solar storms were to hit again in 2012 (for more details about this prediction and how to protect yourself from potentially very long electrical outages click here. The possibility of such an event knocking out the grid is just another reason why you might want to consider having a back up solar generator. Although not much is written about it, the rapid deployment of the smart grid and home based solar systems helps to reduce this risk. Of the approximately 1,368 watts per square meter that hits the earth's atmosphere. As the solar energy passes through the atmosphere, which it does at the speed of light, the atmosphere acts like a filter - absorbing and removing some of the solar energy at the higher end of the electromagnetic spectrum (gamma, x-ray, ultra-violet energy). 368 Watts are either reflected away from the earth – or absorbed by the atmosphere, clouds, and sea – leaving 1about 1,000 watts (= 1 kW) per square meter that reaches the surface of the earth. Note: Solar Panels are rated based on the standard assumption of 1,000 Watts (= 1 kilowatt or 1 kW) per square meter of sunlight strikes the panel perpendicular to the panel (at a temperature of 25˚C and a solar spectrum and atmospheric rating of 1.5). This rating typically is shown on the manufacturer's data sheet as the maximum power or abbreviated as kWp (where p stands for peak or maximum kilowatts of electricity generated under the standard peak conditions). For more information about kWp ratings and what they really mean, click here. Keep in mind that the solar energy (in the form of photons) that hits the earth is primarily visible and infrared energy, although there is also some ultra-violet and trace elements of the higher frequency radiant energy. In order to determine the amount of solar energy that hits a specific place, scientists consider both the amount of direct energy, meaning sunlight coming straight from the sun to the surface (i.e., perpendicular to the ground) and indirect or diffuse insolation, meaning sunlight reflected by other surfaces and molecules in the air to arrive at the surface from all angles. On a cloudy day, one might not see the sun at all, but the region is still fully illuminated by indirect insolation (and solar panels can still produce electricity). Over the course of a year, the percentage of direct vs. indirect insolation varies by region, but a good rule of thumb is that about 2/3 is direct insolation and 1/3 is indirect. Tip: Some specific solar panel manufacturers build panels that are better at converting indirect light to electricity than others, so be sure to do a bit of research before you make your final decision, especially if you are considering a roof-top installation. Note: Current photovoltaic technology converts energy from the visible range into electricity. However, several groups are researching ways to increase PV efficiency by also converting infrared energy into electricity. So while the average amount of solar energy reaching the surface of the earth is 1 kw/m2 – insolation levels at a specific location (i.e., latitude and longitude) will vary depending on the time of the year, time of the day, by altitude, weather patterns, etc. The intensity of insolation per square meter for any specific period of time depends on the latitude, the weather, the season of the year, and the time of day. These variables account for large differences in available insolation at any given moment in different locations around the world. Latitude has a major effect. As expected, areas located closest to the equator receive the most sun on an annual basis. However, as you can see from the graph below – weather, altitude, and other factors cause some areas with the same latitude to have different insolation levels. As a result of satellite technology, and ground observations there is a lot of available information to predict how much insolation will hit any specific part of the planet, on average per month or per year. This is the key variable information used to predict the amount of electricity that should be produced from a solar installation. 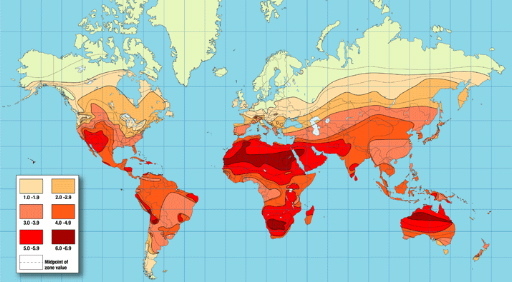 The following map shows different insolation levels for different parts of the earth. Despite the differences in location and weather, average insolation on a 1 m2 surface perpendicular to the sun anywhere on Earth is still approximately 1,000 watts (1 kW) of solar energy on a clear day. This figure of 1,000 watts represents "peak" power or maximum power, undiminished by fog, smog or cloud cover. Note: Photovoltaic / solar cells convert the insolation into electricity – and will work basically everywhere on the planet. However, the more sunshine you get (i.e., the higher the insolation), the more electricity can be generated. Tip:	To learn more about the insolation levels where you live, check out our section on insolation for valuable information and links. Before you can generate any estimate of usable electricity from solar panels you need to start with the annual insolation levels in your area. You'll also need to determine the size of the installation (in square meters), and know the peak power rating of the panels that will be used (kWp). Note: For purposes of comparison all solar panels are rated in terms of peak power (i.e. the maximum power it will produce) based on an industry standard 1,000 watts per square meter of solar energy received. Interestingly, the industry standard conditions used to test solar panels corresponds roughly to midday in summer in Bavaria, Germany. Consequently, there will be some areas that will have insolation levels lower than 1,000 (e.g., areas higher than 45 degrees latitude), and areas where the insolation rating will be higher than 1,000 (e.g., Italy, Spain, much of Africa most of the USA, Middle East, Southern India, some parts of China, Thailand, Australia, etc.). Therefore, in order to estimate the amount of power a particular solar installation will generate you need to multiply the ratio of the composite monthly insolation levels for that specific location divided by the peak power rating of 1,000 and adjust accordingly. The above estimate needs to be reduced by another 15% or more depending on the efficiency of the inverters used, loss of power due to the likelihood that dust & water marks will accumulate on the panels, and age of the panels (they generally lose about 0.5% efficiency per year after they are installed (the amount depends on type of underlying type of solar cells used). Note: There is software used by solar estimators such as PV Kalk (used in Germany) that produces estimates of kWhrs for specific installation sites that are generally accepted by investors, bankers, owners, etc. as being accurate estimates of the electricity that will be generated per year.